→Aquarium Care 101: Can Betta Fish See In The Dark? Can Betta fish see in the dark? This is the overarching question that this particular article will attempt to address. Hopefully, it will help answer some of your questions regarding Betta fish eyesight and possibly give you ideas on how best to care for them. Betta fish are quite beautiful, curious and sociable - quite too much for a fish, you may think, but it’s true. Those three words give the exact description of Betta fish, also known as the Siamese fish (due to its Asian origin). I bet this is one of the reasons why the fish are often kept as pets. But then, before we get all excited about this phenomenon of a fish, there is one question that we have to address and get answers to. Now let’s Answer the Question about Betta Fish Vision in Darkness, Shall We? 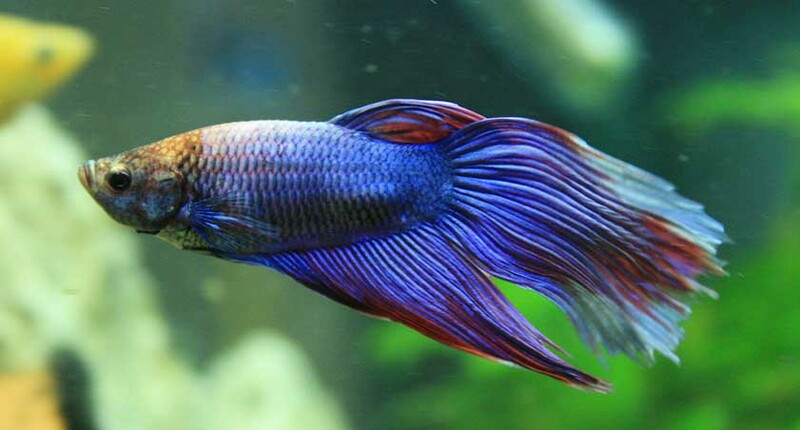 To begin with, Betta fish have a life cycle that revolves around day and night. During the day, Betta fish are active and playful. They eat and swim around due to the presence of light. At night, due to the darkness, these fish will naturally fall asleep. Apparently sleeping is essential as it rejuvenates them and helps them relax. And if perhaps you’re keeping the betta in a relatively dark room, it would be a great idea that you consider lighting the area for sufficient light. A minimum of eight to ten hours of light every day is enough. With time, you’ll realize that the betta fish requires enough light even in darkness in as much as they tend to be inactive. The fact of the matter is that there is very little to almost no risk for the betta fish to be on darkness. They can remain healthy. In general, betta’s vision is somewhat weak in darkness. In most cases though, they thrive better in relatively murky water. They tend to jump from one point to another mostly in fresh or clean water. The thing is, betta fish have a monocular vision. This means that they can see in two directions simultaneously. Furthermore, they also have a reduced depth of perception. Understandably, the iris of betta fish tends to coordinate relatively slowly. It thus makes it difficult for their eyes to adjust faster whether in darkness or brightness. So in darkness, it is pretty essential for the betta fish to get assistance to be able to have reasonably better vision. The lateral line is the main feature that extends sideways of these fishes and contains small holes. These holes are fundamental because they help in compensating the Betta fish poor vision in darkness. These lines kind of measures water pressure, in any case, they are approaching any objects as they move, especially at night or in darkness. Take note that even for the wild Betta catching them is not as easy most people think. Their ability to sense strange objects and movements helps them stay wary of getting caught. Nonetheless, with the best portable fish finders, you can quickly get these adorable aqua fish in their murky waters. In as much as the betta fish can see reasonably in darkness, there is, however, one problem that will often arise; you will be unable to see how beautiful they are at night. One thing that you should also have in mind while minding whether or not betta fish can see in darkness is the fact that they need the shade to rest. If you’re keen enough, you’ll realize that the betta fish always appear pale when the lights are off. Nevertheless, this does not imply that they are not capable of seeing altogether. As they rest during the night, their eyes also tend to be open given that they also do not have eyelids. So it makes perfect sense as to the reasons you need to believe that they can still be able to see even in darkness albeit the vision is poor. What happens is that they are extremely sensitive to any movement taking place around them. So probably, it becomes difficult for you to realize whether or not they see at night given that they can only comfortably rest when the environment is totally calm. Typically, you'll have your betta fish in a betta tank. Most of these tanks are designed with the lighting system. It is recommended just to switch off the lights in the tank when it is dark and allow the betta fish to settle down. If you’re keen enough, which you have to be at the extreme for you to notice it, you’ll realize that immediately the lights go off in the betta tank the bettas will suddenly become terrified and frightened. It is essential to define the difference between sleeping while the lights are off, which is primarily their way of resting and failure to see. When the lights are off, due to the activity the bettas have had during the day, they need the rest and might look for a comfortable spot to sleep or just rest. During this period, they may appear so inactive such that you’d think they do not see at all. However, that is not the case. So mostly, betta fish can see in the dark. They only use their sensory organs, which are linked to the nervous system to execute the vision even when there is darkness. Even if they are numerous in a tank and the lights are off, they will be able to detect where the others are precisely located so that they do not bump on one another. The betta fish can as well tell where the edges of the tank are located such that they are able to feel when they are almost getting to them. So vitally, you need to know that the betta fish can see even at night. They appear weak or relaxed all the same, but that does not imply in any way that they cannot see even when the lights are off. You might see them with eyes open when there is light, and that is how they still behave even when they are in darkness.